Process simulation is used for the design, development, analysis, and optimization of any chemical process, including biodiesel production. Property models provide the basis of computer simulations, being responsible for the accuracy or inaccuracy of the simulation results. 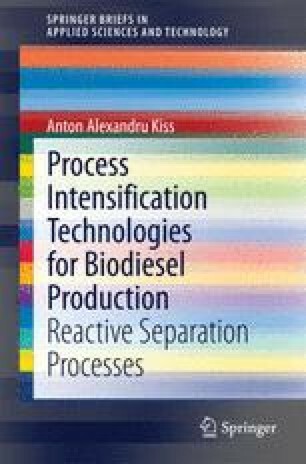 This chapter summarizes the requirements for a successful simulation of a biodiesel production process: recommended property models, best simulation approach (e.g. shortcut, rigorous or hybrid methods), use of equilibrium or rate-based models, and reaction kinetics.